Whether you’re opening a brand spanking new restaurant or looking to upgrade your existing EPOS, investing in an EPOS system that has specifically been designed with restaurants in mind is always going to help you manage your business better. In this day and age, more and more restaurants are moving away from fixed EPOS systems towards portable iPad systems. This type of EPOS system is perfect for restaurants, as it allows waiters and waitresses to take orders at the table, and on the go. Just because these EPOS systems have been condensed into an iPad-sized package, doesn’t mean they’ve lost any of their functionality. In fact, these restaurant EPOS systems come with powerful software that’s packed full of features to help you manage both your front and back of house. So what exactly are these awesome features, and where can you get your hands on one of these innovative restaurant EPOS systems? Keep reading to find out. Alternatively, you can easily cut to the chase and receive quotes and advice directly from the best EPOS suppliers for your business. All you need to do is fill in our form with a few details about your restaurant, and the suppliers that best match your needs will be in touch. The way we manage restaurants is changing, so restaurant POS systems are too. 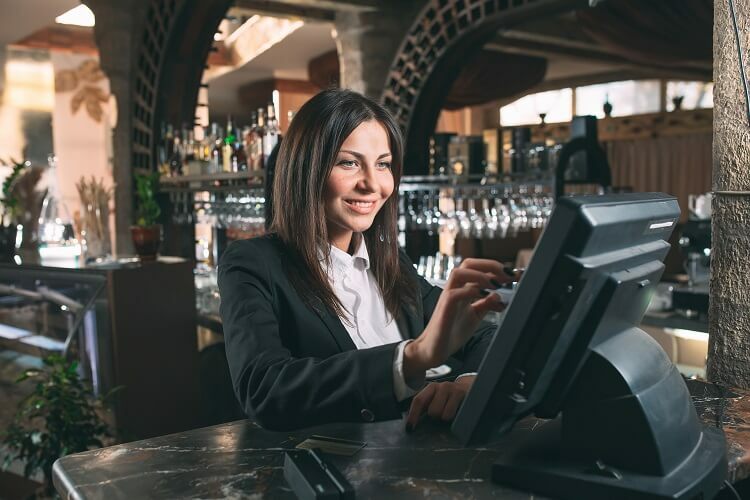 Old fashioned cash registers are no longer up to the job – it’s all about making sure your restaurant runs smoothly and efficiently, and that service is fast and hassle-free. This is why more and more restaurant owners are choosing to invest in, or upgrade to, an iPad restaurant EPOS system. But was is an iPad EPOS system? In a nutshell, an iPad EPOS system is a stylish, modern alternative to the fixed EPOS systems that we’ve come to love (and hate). Thanks to the iPad’s powerful operating system, POS software suppliers can afford to develop lots of heavy features that’ll help you manage your restaurant business more efficiently. And of course, it’s not just about the iPad. As part of their mission to develop the best EPOS for restaurants, suppliers also provide you with stylish card readers and receipt printers, so your restaurant isn’t just about cooking up fresh meals – it’s about looking fresh, too. Conveniently for you, the majority of restaurant EPOS system suppliers also offer their own credit card processing. This means restaurant EPOS systems are an all-in-one, hassle-free solution – perfect for those who want to get their restaurant up and running ASAP, or upgrade their EPOS system without downtime. So what are the features that make iPad POS systems the best EPOS for restaurants? Once a customer order enters the system, an order ticket automatically prints out in the kitchen. This means waiters and waitresses aren’t constantly running back and forth from the kitchen to the floor with written tickets. Link up your EPOS system to your website, and when a customer books a table online, the EPOS system will assign that party a suitable table. As menu items are ordered and bills are paid for, your restaurant EPOS system is quietly keeping track of all the items going out of your restaurant. You can even set your EPOS system to automatically reorder certain items when stock begins to run low. Does your restaurant have a loyalty scheme? Have customers sign up to receive offer emails, and combine your point of sale software with customer relationship management (CRM) software to ensure a constant connection with all of your loyal customers. Which EPOS systems tick all the boxes above? Have a read of our section on the best restaurant EPOS systems below to find out. According to our research, the best EPOS for restaurants come from TouchBistro, Lightspeed Restaurant, Revel Systems, Square, and iZettle. Let’s see how they compare against each other. TouchBistro is at the top of its game. Created for restaurants by ex restaurateurs, you’ll find every single process and every single restaurant-associated niggle is addressed in this clever EPOS system. Best of all, TouchBistro is all about earning you more money. Whether it’s prompting your serving team to upsell or using data to inform you on staffing, you’ll always be one step ahead with a TouchBistro POS. When it comes to EPOS systems, reliability is key. These days, EPOS systems depend heavily on an internet connection to function, so when Lightspeed mentions that its EPOS system works just as well offline as it does online, you know you’re investing in a solid product. Because it’s a cloud-based system, you can literally track your sales data from anywhere. And with areas such as management, staff and ordering covered, a Lightspeed Restaurant POS system certainly has your back in a business sense, too. Revel understands that running a restaurant isn’t just about taking orders and sending food out. There’s just as much going on behind the scenes as there is front of house. With a head for business, the team at Revel Systems has ensured you can integrate its POS system with plenty of essential business platforms. And guess what? With delivery management a feature too, there’s no need to buy separate fleet management software. This means you’re free to take your restaurant business to a whole new level if you wish. quare is a popular choice in the world of restaurant POS – and with its tailored restaurant POS software platform available to download completely free, you can kind of see why. It does counteract this, however, with a slightly more expensive credit card fee. With Square, there are no monthly fees – and as long as you have your own iPad, you don’t have to pay much when it comes to hardware, either. Better still, it’s packed full of all the features you could possibly need to run your restaurant. While restaurants come in all shapes and sizes, iZettle is perfect for smaller operations. Combine an iPad and an iZettle card reader, and you’ll benefit from an inexpensive restaurant EPOS system that does everything the big guns can do too. Whether you’re looking to build customer relationships, better manage your staff, or gain a greater idea of what’s happening behind the scenes, iZettle has plenty of features that can help. The truth is, all of the restaurant POS systems mentioned above will do a fantastic job of helping you to manage your restaurant. So really, when it comes to choosing the best EPOS for restaurants, it’s all about getting your EPOS system for the best price. This is where Expert Market comes in. You can quickly and easily compare EPOS quotes, simply by filling in our form with a few details about your restaurant business. Once you’ve filled it in, the best suppliers for your requirements will be in touch with competitive quotes.